SALTWORKS is pleased to present Blue Peony and Impure Thoughts, featuring new works on paper and an installation by Atlanta-based artist Jiha Moon. The exhibition will be on view from January 23, 2010 through March 6, 2010. This is the second solo exhibition of Ms. Moon's work at the gallery. Throughout her artistic career, the multivalent paintings of Korea-born and Atlanta-based artist Jiha Moon have operated in several distinctive yet visually cohesive realms. 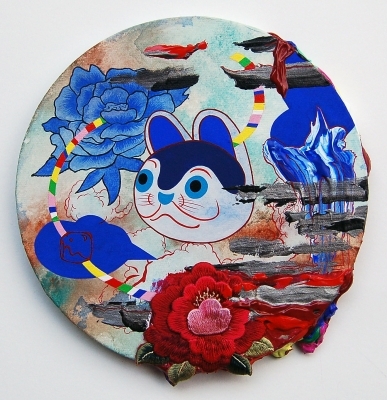 As the title of her current Saltworks Gallery exhibition―“Blue Peony and Impure Thoughts”―suggests, this handsome body of work simultaneously conflates cultural references and confounds expectations, all while accommodating multiple audience interpretations. The unnatural abounds in everyday life and in Moon’s compositions, like the blue peony, found in Cheoyong and others. Traditional pink or white peonies represent luxury and wealth―the opposite of lotuses, which signify spirituality―but blue peonies don’t exist in nature, twisting the expectation of these signature shapes. In this spirit, another shifting character in her work is an inu-hariko, another symbol for good fortune, which looks like a cat, but is actually a dog found on traditional Japanese toys and sweets like Botan Rice Candy (botan means peony in Japanese). Therefore, these lush surfaces have deeper, changeable underpinnings, as the “true” identities of each figure fades in and out of focus. - Excerpt from exhibition essay by Atlanta-based curator Stephanie Greene.